Invokana and other Type 2 diabetes medications called SGLT2 inhibitors have been named in regulatory warnings in the U.S. and Europe over a possible link to diabetic ketoacidosis. (PRLEAP.COM) February 18, 2016 - As Invokana lawsuits (http://www.rxinjuryhelp.com/invokana/lawsuit/) involving the drug's alleged connection to diabetic ketoacidosis mount in U.S. courts, Bernstein Liebhard LLP notes that regulators in Europe have issued new safety recommendations for patients using this and other SGLT2 inhibitor Type 2 diabetes drugs. In a statement issued on February 12th, the European Medicines Agency's Pharmacovigilance Risk Assessment Committee (PRAC) recommended that individuals using SGLT2 inhibitors immediately contact their doctor if they experience symptoms indicative of ketoacidosis, including deep breathing, confusion, unusual sleepiness or fatigue, sweet smelling breath, a sweet or metallic taste in the mouth, or changes in the odor of urine or sweat. PRAC also advised doctors to immediately cease SGLT2 inhibitor treatment in patients who present with such symptoms until the cause is identified and treated. "Our Firm has heard from a number of patients who allegedly experienced diabetic ketoacidosis due to their use of Invokana or another SGLT2 inhibitor. We are pleased that regulators in the U.S. and abroad have brought much-needed attention to this important public health issue," says Sandy A. Liebhard, a partner at Bernstein Liebhard LLP, a nationwide law firm representing victims of defective drugs and medical devices. The Firm is now evaluating product liability claims on behalf of Type 2 diabetes patients who developed ketoacidosis allegedly related to the use of Invokana and other SGLT2 inhibitors. In addition to Invokana, other SGLT2 inhibitors approved for use in the U.S. include Invokamet, Farxiga, Xigduo XR, Jardiance, and Glyxambi. In May 2015, the U.S. Food & Drug Administration (FDA) announced that it was investigating 20 reports of diabetic ketoacidosis in patients taking SGLT2 inhibitors to determine whether changes were needed in the prescribing information for this class of medications. This past December, the agency ordered the drugs' manufacturers to modify their labels with new information regarding this possible complication. The alert also indicated that from March 2013 to May 2015, the FDA had identified 73 cases of ketoacidosis among patients treated with SGLT2 inhibitors. "Patients should stop taking their SGLT2 inhibitor and seek medical attention immediately if they have any symptoms of ketoacidosis, a serious condition in which the body produces high levels of blood acids called ketones," the FDA said in its December 4th communication. Type 2 diabetes patients who were hospitalized for diabetic ketoacidosis while using Invokana or another SGLT2 inhibitor medication may be entitled to compensation for medical bills and other related damages. 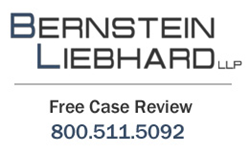 To learn more about filing an Invokana lawsuit, please visit Bernstein Liebhard LLP's website, or call the Firm directly at 800-511-5092. Bernstein Liebhard LLP is a New York-based law firm exclusively representing injured persons in complex individual and class action lawsuits nationwide since 1993. As a national law firm, Bernstein Liebhard LLP possesses all of the legal and financial resources required to successfully challenge billion dollar pharmaceutical and medical device companies. As a result, our attorneys and legal staff have been able to recover more than $3.5 billion on behalf of our clients. The Firm was named by The National Law Journal to the Plaintiffs' Hot List, recognizing the top plaintiffs firms in the country, for 12 consecutive years. Bernstein Liebhard LLP is the only firm in the country to be named to this prestigious list for a dozen consecutive years.